Former Brexit Secretary Dominic Raab has accused Leo Varadkar of leaking and misrepresenting a conversation he had with Ireland's foreign minister. The conversation took place at a dinner in October last year and an account was reported in the Daily Telegraph. It said that Mr Raab had demanded the right to pull the UK out of the backstop after just three months. A spokesman for the Irish government said: "There is no basis for this allegation." He added: "Mr Raab should produce any evidence if he has it." The backstop is an insurance policy in the Brexit deal that aims to avoid a hard border on the island of Ireland. Does the Irish peace accord rule out a hard border? Brexit: A way out, or a dead end? Mr Raab said he had not made such a proposal and the conversation was leaked in a "misrepresenting, inaccurate way by the taoiseach [Mr Varadkar] directly". He added that he had only asked Mr Coveney not to rule out looking at a mechanism for exiting the backstop. 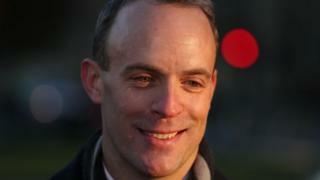 Mr Raab also suggested that the Dublin government would need to find "a ladder to climb down" over the backstop. "They took a such a trenchant line on the backstop, such a very political line," he said. "We do need to understand we probably need to work to together with our Irish friends to work out a mechanism that not only deals with the practical operational issues, but also is politically acceptable for them. "They are in a very difficult position now, mainly because of the particularly strong political position that was taken by the taoiseach"
He was later asked what such a "ladder" might consist of. Mr Raab suggested this could be a unilateral backstop exit mechanism for the UK but with "a string of assurances" for the Irish government. He also suggested that various technical and administrative measures could be used to keep the Irish border frictionless in all circumstances. Mr Raab said the issue was "eminently solvable" with goodwill, practical cooperation, technology and decentralised processes. He also said the UK side had failed to press the issue of making the backstop time-limited during negotiations last summer. In July, he told Michel Barnier, the EU chief negotiator, that there needed to be a finite backstop, while Mr Barnier said he understood it needed to be "short". "I don't think we grasped that opportunity. It was certainly in play. That was not followed through with enough vigour," Mr Raab said. He said some people in Dublin, Northern Ireland and the European Commission see the backstop as an opportunity to "control" the UK after Brexit.